On Monday, Gov. 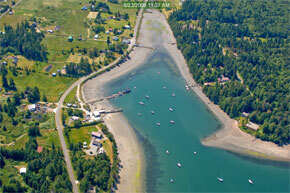 Jay Inslee announced the winners of the 2013 Smart Communities Award. We’re pleased to report that one of the awards went to DNR and partners who were collectively part of a diverse group of stakeholders that developed two management plans for two water bodies in Jefferson county—Mystery Bay and South Port Townsend Bay. The Governor’s Smart Communities Award recognizes smart growth planning and projects that contribute to the quality of life in Washington state. The Mystery Bay and South Port Townsend Bay management plans address conflicting uses of natural resources through a creative and collaborative planning process that involved state, local, and tribal governments; private businesses; and non-governmental organizations. Planning also included broad public involvement. Both plans balance the need to protect commercial shellfish harvest beds and natural resources while also providing opportunities for moorage and other commercial and public recreation uses. Shellfish harvesting in both bays was in danger of being shut down largely because of the increasing amount of boats anchored or moored near shellfish beds in both bays. Key elements of the plans include removing unpermitted and unauthorized vessels and buoys as well as establishing voluntary “no-anchor zones” near the shellfish beds. As a result of this creative collaboration, shellfish beds in both bays remain open and profitable and the bays are also open for transient moorage and for permanent vessel moorage for authorized users. The Mystery Bay Management Plan, which also won a national award last fall, served as a model for other planning efforts, including South Port Townsend Bay in Port Hadlock and Quartermaster Harbor. For more information about the Mystery Bay Management Plan, watch the independently produced video “Mystery Bay – finding balance.” The film features from-the-heart commentaries by the many stakeholders who participated in putting together the Mystery Bay Management Plan. Start your engines for the long-awaited opening of DNR’s ORV trails at Reiter!